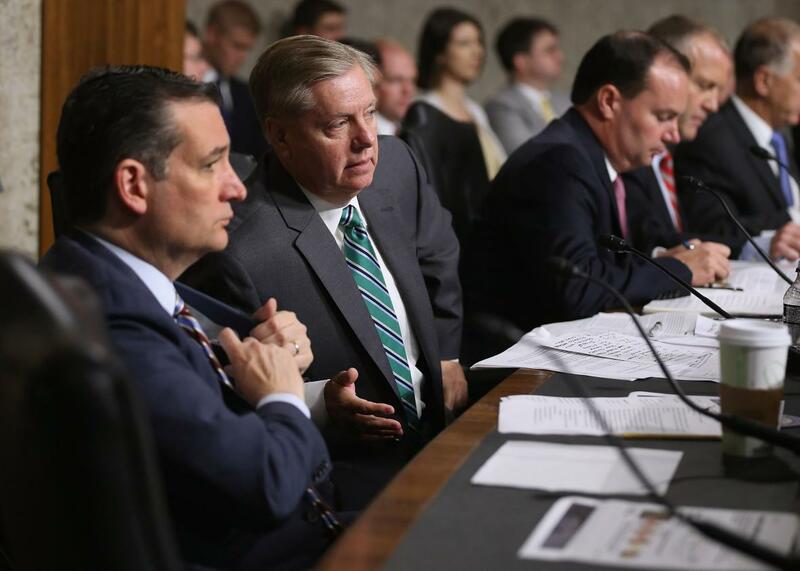 Senate Armed Services Committee memebrs and Republican presidential candidates Sen. Ted Cruz and Sen. Lindsey Graham prepare to question witnesses during a hearing about Iran nuclear deal on July 29, 2015. Throughout the discussion about the Iran nuclear deal, President Obama has attempted to draw parallels with the 2002 debate over authorizing military action against Iraq, pointing out that “many of same people” who supported war then oppose the deal now. However, it’s possible that the members of Congress opposing the deal have taken a lesson from the Iraq debate: that it’s best to avoid responsibility for a risky foreign policy decision. September’s big vote (or lack thereof) is a win-win for congressional Republicans—they get to oppose the deal without the responsibility that comes with it—and for Obama, who gets his Iran deal, after all. This would suggest that the Iran debate has been mostly political theater since Obama agreed to let Congress hold a yes/no vote on the deal back in April. No Republicans were ever going to support it, no matter what was in it, but it was never actually in serious danger of being voted down. The Iraq war turned into an albatross for the Democrats who supported it, as Obama, who ran in part on his opposition in 2008, knows well. Democrats would love it if GOP senators who oppose the Iran deal will be similarly punished at the polls in a few years, but it’s not likely to turn out that way. If the deal works perfectly—Iran still doesn’t have a nuclear weapon in, let’s say, 2020—the fact that a given senator was skeptical about the agreement in 2015 is unlikely to be a major political issue. If it turns out to be a disastrous mistake, they’re on record as having supported it. A similar dynamic is at work in America’s war against ISIS, which has now lasted a year despite having never been authorized by Congress. This could be viewed as an abrogation of the way military action is supposed to be conducted under U.S. law, but for most members of Congress, it works out just fine: They can criticize Obama’s conduct of the war without taking any ownership of it. For the moment, this arrangement seems to suit both sides fine. But going forward, it doesn’t really seem advisable to have a system in which the president conducts matters of war and peace without any congressional oversight and members of Congress never cross party lines to support initiatives whose success isn’t guaranteed.